This module introduces gel electrophoresis principles and applications for genetics and plant breeding in text, animation, and video formats. Gel electrophoresis is commonly used in plant breeding and genomics for genotyping with molecular markers, but there are several other applications as well (see below). For example, specific DNA fragments used as markers and isolated from individual plants are amplified by the polymerase chain reaction (PCR) and the resulting DNA fragments are subsequently loaded on a gel. The gel is a solid, gelatin-like substance used to separate DNA fragments based on size. The gel is placed in a conductive salt buffer to which an electrical field is applied. As the negatively-charged DNA fragments migrate toward the positive pole, the gel acts as a size filter, with smaller fragments migrating faster than larger fragments. Gel electrophoresis [Online animation]. Dolan DNA Learning Center, Cold Springs Harbor Laboratory. 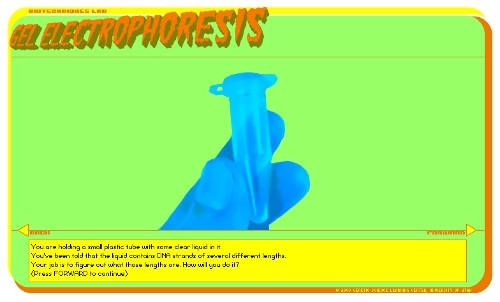 Available at: www.dnalc.org/resources/animations/gelelectrophoresis.html (verified 31 May 2012). 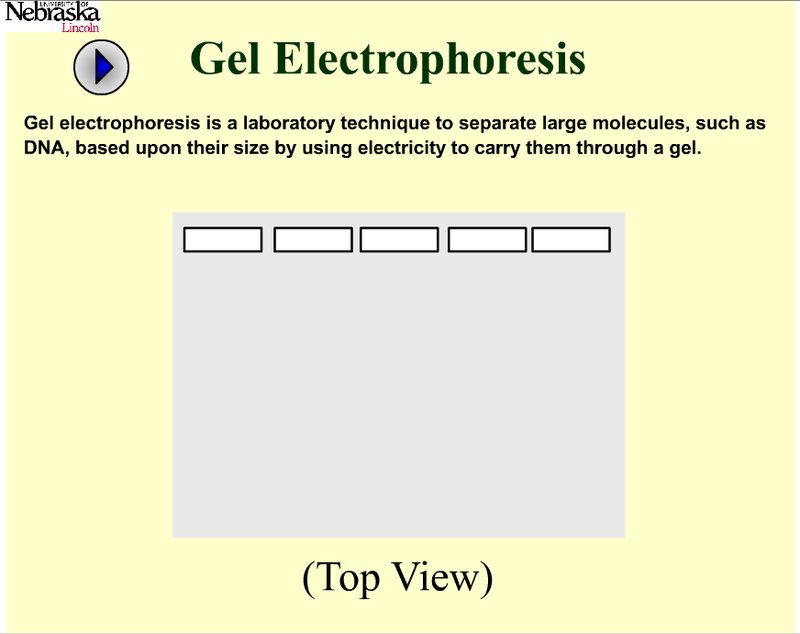 Gel electrophoresis virtual lab [Online animation]. Genetic Science Learning Center, University of Utah. Available at: learn.genetics.utah.edu/content/labs/gel/ (verified 31 May 2012). Lee, D. and P. Hain. 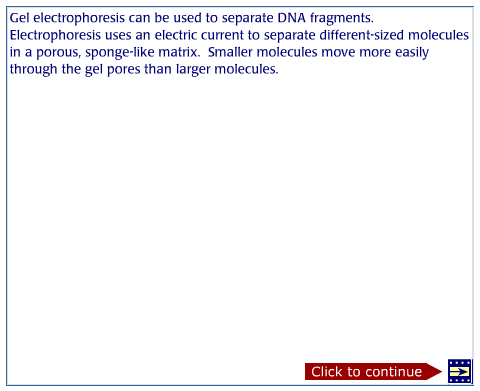 Electrophoresis: How scientists observe fragments of DNA [Online lesson]. Plant and Soil Sciences eLibrary. University of Nebraska – Lincoln. Available at: http://plantandsoil.unl.edu/croptechnology2005/pages/index.jsp?what=topicsD&topicOrder=1&informationModuleId=1065724861 (verified 24 Sept 2010). Talpallikar, V., D. Lee, and P. Hain. 2000. Gell electrophoresis [Online animation]. Plant and Soil Sciences eLibrary. University of Nebraska – Lincoln. Available at: http://plantandsoil.unl.edu/croptechnology2005/pages/animationOut.cgi?anim_name=Gel_electrophoresis.swf (verified 7 Dec 2010). Wikipedia Contributors. 2010. Gel electrophoresis. Wikipedia, The Free Encyclopedia. Available at: http://en.wikipedia.org/w/index.php?title=Gel_electrophoresis&oldid=397218980 (verified 31 May 2012).